It's summer and that means that it's time to kick back, relax, and enjoy a movie marathon. Netflix has a plethora of movies, but I mainly use Netflix for binge-watching TV shows. 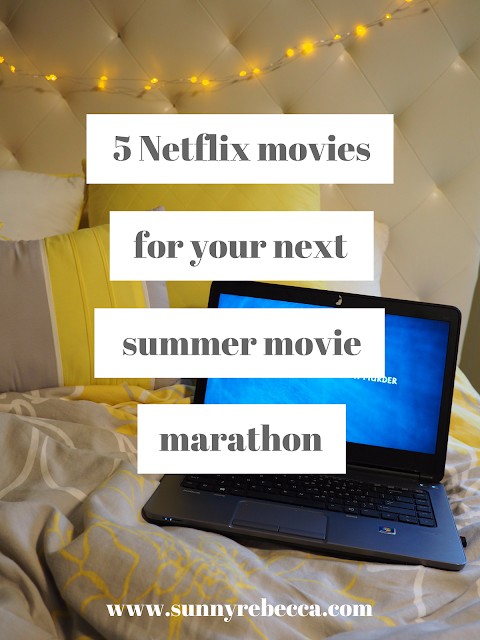 In case you're looking for a movie marathon instead of a day of binge-watching, I've compiled some of my favorite movies on Netflix that you can love them as well during your relaxing summer days. I tried to pick some more light-hearted movies rather than intense ones, because that's what summer is about, relaxing, having some laughs, and just enjoying your time off. Turn on the TV, it's time for a summer movie marathon. Just arrived to Netflix is the latest Disney princess movie. I originally saw this movie in the theater and absolutely loved it. The songs were so catchy and the ending was incredibly sweet. I think that it has a fantastic message of how important it is to be yourself, which is something that everyone should know, no matter the age. If you've been living under a rock and you don't know what Moana is about, it's about a girl named Moana living on a Polynesian island. Her grandmother always told her the story of a demi-god named Maui that stole the heart of the island, causing a curse that dooms the island, causing the crops to die. Because of that, Moana goes on an adventure, determined to restore the heart of the island and save her home island. It's incredibly sweet and cute, filled with lots of laughable moments and also adorable animal sidekicks. 13 Going on 30 just might be one of my favorite movies, not just one of my favorite movies on Netflix. In her teenage life, the main character, Jenna, had been vying to become one of the popular kids, doing anything to try and fit it with them, while neglecting her best friend Matt, since he wasn't "cool" enough. On her thirteenth birthday, she wishes to be 30 after seeing a magazine article about being "thirty, flirty, and thriving". 13 Going on 30 follows Jenna's discoveries of adulthood as a 13-year old who isn't quite versed on things that she had never experienced, offering comedic moments, trying to latch onto a whole new world. Let's be real, Finding Nemo was good, but dare I say, Finding Dory might be even better. Maybe because I can't ever remember a time when I hadn't seen Finding Nemo, but I loved Finding Dory. It was cute, funny, and heart-warming. I'll be honest, I cried. I'm pretty sure that everyone knows what Finding Dory is about, but if you don't Finding Dory is about the fish named Dory from the original Finding Nemo movie who has short-term memory loss. Because of that, she has forgotten her parents. One day, she stumbles upon a memory of them and is determined to find them again. The story follows Dory, Nemo, Marlin, and some new friends on a journey of finding her parents. A teenage movie, 10 Things I Hate About You follows the life of sisters, Bianca and Kat. Bianca is excited to go out and party and is eager to date a popular guy, but her father says that she cannot go on a date until her older sister Kat does. Bianca gets help from Cameron, a new guy that is interested in her, in order to match up Kat with rebellious Patrick Verona. This movie is a classic teen movie, pretty predictable, but nevertheless enjoyable. Another fun and light-hearted cartoon movie, Zootopia is full of laughs, but it also has a fantastic underlying message about discrimination. In a land of animals, there is a city center, called Zootopia. Zootopia promises that it's a place where anyone can be anything, regardless of who they are. Judy Hopps has always wanted to be a police officer and finally gets to become one when she goes to Zootopia. However, she quickly realizes that the prey are not treated as equals in comparison to the predators, being stuck watching parking meters, she strives to prove her worth by uncovering a mystery regarding missing animals. Zootopia seems like a fun, light-hearted film, but it also covers how the animals can be discriminated based off of predator and prey and how the discrimination can work both ways, paralleling the world that we know today. Plus, all the characters are super cute. What are some of your favorite movies on Netflix? I have seen 10 Things I Hate About You soooo many times, it's my fave! I've seen all of these! :) They're the best!